Proprietary Name: Phenylephrine Hydrochloride What is the Proprietary Name? Non-Proprietary Name: Phenylephrine Hydrochloride What is the Non-Proprietary Name? 42023 - Par Pharmaceutical, Inc.
Phenylephrine Hydrochloride with NDC 42023-213 is a a human prescription drug product labeled by Par Pharmaceutical, Inc.. The generic name of Phenylephrine Hydrochloride is phenylephrine hydrochloride. The product's dosage form is injection and is administered via intravenous form. Labeler Name: Par Pharmaceutical, Inc.
FDA Application Number: ANDA210025 What is the FDA Application Number? 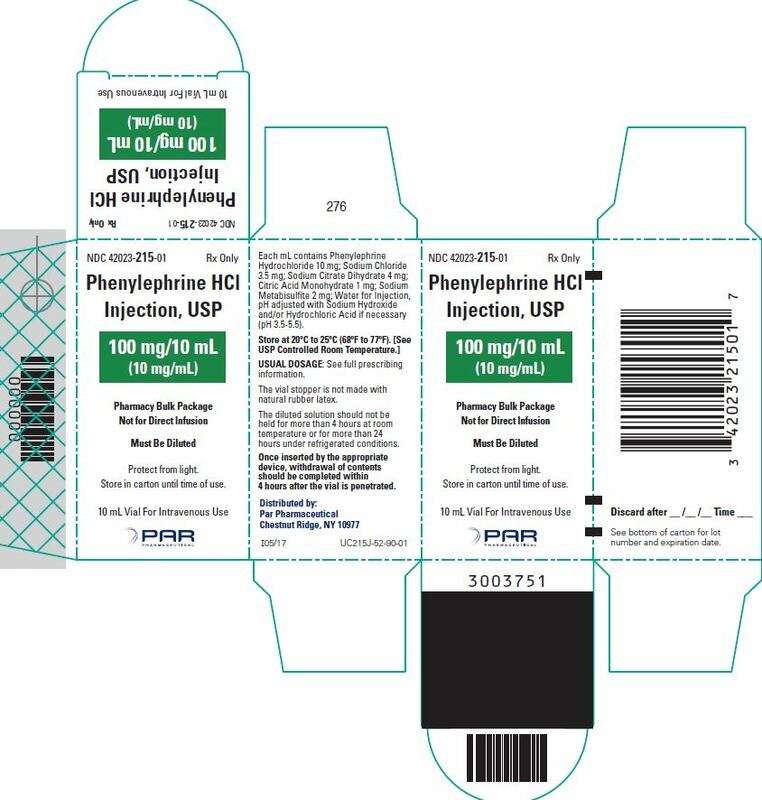 Phenylephrine Hydrochloride Injection, 10 mg/mL is an alpha-1 adrenergic receptor agonist indicated for the treatment of clinically important hypotension resulting primarily from vasodilation in the setting of anesthesia. Phenylephrine Hydrochloride Injection, 10 mg/mL must be diluted before administration as an intravenous bolus or continuous intravenous infusion to achieve the desired concentration: Bolus : Dilute with normal saline or 5% dextrose in water. Continuous infusion : Dilute with normal saline or 5% dextrose in water.Parenteral drug products should be inspected visually for particulate matter and discoloration prior to administration. Do not use if the solution is colored or cloudy, or if it contains particulate matter. The diluted solution should not be held for more than 4 hours at room temperature or for more than 24 hours under refrigerated conditions. Discard any unused portion.During Phenylephrine Hydrochloride Injection administration: Correct intravascular volume depletion. Correct acidosis. Acidosis may reduce the effectiveness of phenylephrine. The following are the recommended dosages for the treatment of hypotension during anesthesia. The recommended initial dose is 40 to 100 mcg administered by intravenous bolus. May administer additional boluses every 1-2 minutes as needed; not to exceed a total dosage of 200 mcg.If blood pressure is below the target goal, start a continuous intravenous infusion with an infusion rate of 10 to 35 mcg/minute; not to exceed 200 mcg/minute.Adjust dosage according to the blood pressure goal. For bolus intravenous administration, prepare a solution containing a final concentration of 100 mcg/mL of Phenylephrine Hydrochloride Injection:Withdraw 10 mg (1 mL of 10 mg/mL) of Phenylephrine Hydrochloride Injection and dilute with 99 mL of 5% Dextrose Injection or 0.9% Sodium Chloride Injection.Withdraw an appropriate dose from the 100 mcg/mL solution prior to bolus intravenous administration. For continuous intravenous infusion, prepare a solution containing a final concentration of 20 mcg/mL of Phenylephrine Hydrochloride Injection in 5% Dextrose Injection or 0.9% Sodium Chloride Injection:Withdraw 10 mg (1 mL of 10 mg/mL) of Phenylephrine Hydrochloride Injection and dilute with 500 mL of 5% Dextrose Injection or 0.9% Sodium Chloride Injection. The Pharmacy Bulk Vial is intended for dispensing of single doses to multiple patients in a pharmacy admixture program and is restricted to the preparation of admixtures for infusion. Each closure shall be penetrated only one time with a suitable sterile transfer device or dispensing set that allows measured dispensing of the contents. The Pharmacy Bulk Vial is to be used only in a suitable work area such as a laminar flow hood (or an equivalent clean air compounding area). Dispensing from a pharmacy bulk vial should be completed within 4 hours after the vial is penetrated. Because of its increasing blood pressure effects, Phenylephrine Hydrochloride Injection can precipitate angina in patients with severe arteriosclerosis or history of angina, exacerbate underlying heart failure, and increase pulmonary arterial pressure. Phenylephrine Hydrochloride Injection can cause excessive peripheral and visceral vasoconstriction and ischemia to vital organs, particularly in patients with extensive peripheral vascular disease. Extravasation of Phenylephrine Hydrochloride Injection can cause necrosis or sloughing of tissue. The infusion site should be checked for free flow. Care should be taken to avoid extravasation of Phenylephrine Hydrochloride Injection. Phenylephrine Hydrochloride Injection can cause severe bradycardia and decreased cardiac output. Phenylephrine Hydrochloride Injection contains sodium metabisulfite, a sulfite that may cause allergic-type reactions, including anaphylactic symptoms and life-threatening or less severe asthmatic episodes in certain susceptible people. The overall prevalence of sulfite sensitivity in the general population is unknown and probably low. Sulfite sensitivity is seen more frequently in asthmatic than in nonasthmatic people. Phenylephrine Hydrochloride Injection can increase the need for renal replacement therapy in patients with septic shock. Monitor renal function. The increasing blood pressure response to adrenergic drugs, including Phenylephrine Hydrochloride Injection, can be increased in patients with autonomic dysfunction, as may occur with spinal cord injuries. Oxytocic drugs potentiate the increasing blood pressure effect of sympathomimetic pressor amines including Phenylephrine Hydrochloride Injection [see Drug Interactions (7.1)], with the potential for hemorrhagic stroke. Pregnancy Category CRisk SummaryThere are no adequate or well-controlled studies with phenylephrine hydrochloride injection in pregnant women, nor have animal reproduction studies been conducted. Published studies in normotensive pregnant rabbits report early onset labor, increased fetal lethality, and adverse placental effects with subcutaneous phenylephrine administration during gestation at doses approximately 1.9-times the total daily human dose. Published studies in normotensive pregnant sheep report decreased uterine blood flow and decreased PaO2 in the fetus with intravenous phenylephrine administration during late gestation at doses less than and similar to the human dose. It is not known whether Phenylephrine Hydrochloride Injection can cause fetal harm when administered to a pregnant woman. 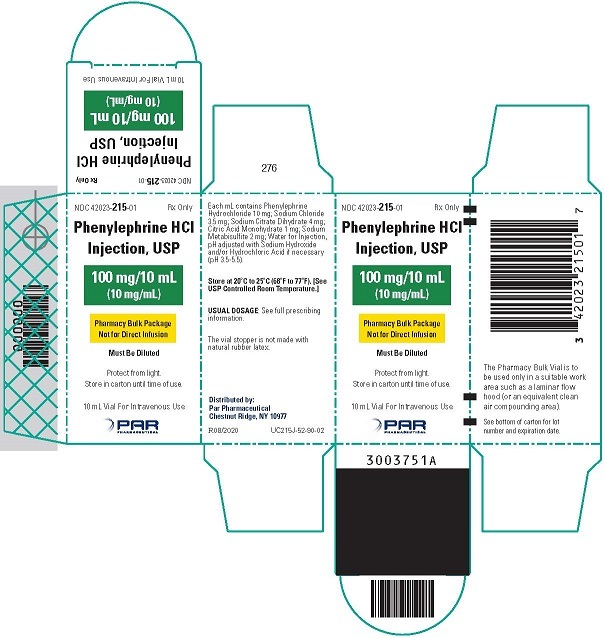 Phenylephrine Hydrochloride Injection should be given to a pregnant woman only if the potential benefit justifies the potential risk to the fetus.Clinical ConsiderationsLabor and DeliveryThe most common maternal adverse reactions reported in published studies of phenylephrine use during neuraxial anesthesia during Cesarean delivery include nausea and vomiting, bradycardia, reactive hypertension, and transient arrhythmias. Phenylephrine, when administered during labor or delivery, does not appear to alter either neonatal Apgar scores or umbilical artery blood-gas status.DataAnimal DataStudies in the published literature evaluating subcutaneously administered phenylephrine (0.33 mg/kg, TID) in normotensive pregnant rabbits reported fetal deaths, adverse histopathology findings in the placenta (necrosis, calcification and thickened vascular walls with narrowed lumen) and possible teratogenic effects (one incidence of clubbed feet, partial development of the intestine) when treatment was initiated during the first trimester or later; and premature labor when treatment was initiated at the second trimester or later. The doses administered were 1.9-times the total daily human dose of 10 mg/day based on a body surface area comparison. Published studies in pregnant normotensive sheep demonstrate that intravenous phenylephrine (4 mcg/kg/min for 30 minutes, equivalent to 3.6 to 4.1 mcg/kg/min human equivalent dose based on body surface area) administered during the third trimester of pregnancy decreased uterine blood flow by 42%. This dose is 1.1- to 1.2-times the human bolus dose of 200 mcg/60 kg person based on body surface area. Mean fetal blood pressure and heart rate fluctuated above and below controls by about 7% during the infusion. Fetal PaO2 was significantly decreased by approximately 26% of control during the infusion. Likewise, PaCO2 was increased and pH was decreased. The clinical significance of these findings is not clear; however, the results suggest the potential for cardiovascular effects on the fetus when phenylephrine is used during pregnancy. It is not known whether phenylephrine is present in human milk. The developmental and health benefits of breastfeeding should be considered along with the mother’s clinical need for Phenylephrine Hydrochloride Injection and any potential adverse effects on the breastfed child from the drug or from the underlying maternal condition. Exercise caution when Phenylephrine Hydrochloride Injection is administered to a nursing woman. Clinical studies of phenylephrine did not include sufficient numbers of subjects aged 65 and over to determine whether they respond differently from younger subjects. Other reported clinical experience has not identified differences in responses between the elderly and younger patients. In general, dose selection for an elderly patient should be cautious, usually starting at the low end of the dosing range, reflecting the greater frequency of decreased hepatic, renal, or cardiac function, and of concomitant disease or other drug therapy. In patients with liver cirrhosis [Child Pugh Class B and Class C], dose-response data indicate decreased responsiveness to phenylephrine. Start dosing in the recommended dose range but consider that you may need to give more phenylephrine in this population. In patients with end stage renal disease (ESRD), dose-response data indicate increased responsiveness to phenylephrine. Consider starting at the lower end of the recommended dose range, and adjusting dose based on the target blood pressure goal. Overdose of Phenylephrine Hydrochloride Injection can cause a rapid rise in blood pressure. Symptoms of overdose include headache, vomiting, hypertension, reflex bradycardia, a sensation of fullness in the head, tingling of the extremities, and cardiac arrhythmias including ventricular extrasystoles and ventricular tachycardia. Phenylephrine is an alpha-1 adrenergic receptor agonist. Phenylephrine Hydrochloride Injection, USP, 10 mg/mL is a sterile, nonpyrogenic solution for intravenous use. It must be diluted before administration as an intravenous bolus or continuous intravenous infusion. The chemical name of phenylephrine hydrochloride is (-)-m-hydroxy-α-[(methylamino)methyl]benzyl alcohol hydrochloride, and its structural formula is depicted below:Phenylephrine hydrochloride is soluble in water and ethanol, and insoluble in chloroform and ethyl ether. Phenylephrine Hydrochloride Injection, USP, 10 mg/mL is sensitive to light. Each mL contains: phenylephrine hydrochloride 10 mg, sodium chloride 3.5 mg, sodium citrate dihydrate 4 mg, citric acid monohydrate 1 mg, and sodium metabisulfite 2 mg in water for injection. The pH is adjusted with sodium hydroxide and/or hydrochloric acid if necessary. The pH range is 3.5-5.5. Phenylephrine hydrochloride is an α-1 adrenergic receptor agonist. Interaction of phenylephrine with α1-adrenergic receptors on vascular smooth muscle cells causes activation of the cells and results in vasoconstriction. Following phenylephrine hydrochloride intravenous administration, increases in systolic and diastolic blood pressures, mean arterial blood pressure, and total peripheral vascular resistance are observed. The onset of blood pressure increase following an intravenous bolus phenylephrine hydrochloride administration is rapid, typically within minutes. As blood pressure increases following intravenous administration, vagal activity also increases, resulting in reflex bradycardia. Phenylephrine has activity on most vascular beds, including renal, pulmonary, and splanchnic arteries. Following an intravenous infusion of phenylephrine hydrochloride, the observed effective half-life was approximately 5 minutes. The steady-state volume of distribution of approximately 340 L suggests a high distribution into organs and peripheral tissues. The average total serum clearance is approximately 2100 mL/min. The observed phenylephrine plasma terminal elimination half-life was 2.5 hours.Phenylephrine is metabolized primarily by monoamine oxidase and sulfotransferase. After intravenous administration of radiolabeled phenylephrine, approximately 80% of the total dose was eliminated within first 12 h; and approximately 86% of the total dose was recovered in the urine within 48 h. The excreted unchanged parent drug was 16% of the total dose in the urine at 48 h post intravenous administration. There are two major metabolites, with approximately 57 and 8% of the total dose excreted as m-hydroxymandelic acid and sulfate conjugates, respectively. The metabolites are considered not pharmacologically active. Carcinogenesis: Long-term animal studies that evaluated the carcinogenic potential of orally administered phenylephrine hydrochloride in F344/N rats and B6C3F1 mice were completed by the National Toxicology Program using the dietary route of administration. There was no evidence of carcinogenicity in mice administered approximately 270 mg/kg/day (131-times the maximum recommended daily dose of < 10 mg/day) or rats administered approximately 50 mg/kg/day (48-times the maximum recommended daily dose of < 10 mg/day) based on body surface area comparisons.Mutagenesis: Phenylephrine hydrochloride tested negative in the in vitro bacterial reverse mutation assay (S.typhimurium strains TA98, TA100, TA1535 and TA1537), the in vitro chromosomal aberrations assay, the in vitro sister chromatid exchange assay, and the in vivo rat micronucleus assay. Positive results were reported in only one of two replicates of the in vitro mouse lymphoma assay.Impairment of Fertility: Studies to evaluate the effect of phenylephrine on fertility have not been conducted. The evidence for the efficacy of Phenylephrine Hydrochloride Injection is derived from studies of phenylephrine hydrochloride in the published literature. The literature support includes 16 studies evaluating the use of intravenous phenylephrine to treat hypotension during anesthesia. The 16 studies include 9 studies where phenylephrine was used in low-risk (ASA 1 and 2) pregnant women undergoing neuraxial anesthesia during Cesarean delivery, 6 studies in non-obstetric surgery under general anesthesia, and 1 study in non-obstetric surgery under combined general and neuraxial anesthesia. Phenylephrine has been shown to raise systolic and mean blood pressure when administered either as a bolus dose or by continuous infusion following the development of hypotension during anesthesia. Phenylephrine Hydrochloride Injection, USP, 10 mg/mL is supplied as follows: NDC No. Strength How Supplied 42023-213-25 10 mg/mL 1 mL single-dose vial (supplied in packages of 25) 42023-214-10 10 mg/mL5 mL; Pharmacy Bulk Package (supplied in packages of 10)42023-215-0110 mg/mL10 mL vial; Pharmacy Bulk Package (supplied as a single unit)Vial stoppers are not manufactured with natural rubber latex. Store Phenylephrine Hydrochloride Injection, USP, 10 mg/mL at 20°C to 25°C (68°F to 77°F). [See USP Controlled Room Temperature.] Protect from light. Store in carton until time of use. The 1 mL vial is a single-dose vial; the 5 and 10 mL vials are pharmacy bulk packages.The diluted solution should not be held for more than 4 hours at room temperature or for more than 24 hours under refrigerated conditions. Discard any unused portion.